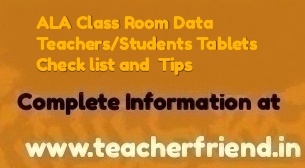 AP Anandha Lahari Programme ALA Class Room Data Based Teachers/Students Tablets Check list and Tips and comfortably in the classroom and also to better maintain Guidelines to the teachers/AP ALA Class Room Maintaining Data 4 students/1 Teacher Anandha Lahari Programme ( ALA) Tablets User Guidelines and Check list Download. The following tips and check list will help Anandha Lahari Programme (ALA) teachers to start using the tablets sooner and comfortably in the classroom and also to better maintain them. Once teacher receives the tabs, teacher must fully charge all the tabs atleast 8hrs. Please charge the tabs every day atleast 4hrs. Inthe Teacher tab, make sure teacher and students are available. Make sure to charge the tabs every day. Students must be placed in the ladder as per the current levels not from the first milestone. When can I start transferring my students from Teacher Tablet to Student Tablets? orientation location to discuss with your MC if any questions. Your ALA Master Coach is just a phone call away to help you answer any questions you may have in this regard and to get ready with your tablets to use in your classroom. Please use ‘Options’ feature on your RT login screen(on Top left corner) for your language selection only. DO NOT play with rest of the features in it as there is a chance that you will lose all your Classroom data.